Jean and I were sitting in our favorite café in Toulon, Gauloises in hand with yellow stains down to our fingernails, when I saw a quite peculiar thing. I just happened to be looking up from my Verlaine, and there, running down the streets of the town, was a rather large pink rhinoceros. "Yes, Jean, of course we're French. But this is a translation of an absurdist short story from French to English. Assistant Professor Herbert Mishkin of the University of Havertown PA is being paid good money by Shmendrick Press to make sure we’re all speaking English!" "Eh bien," said Jean. 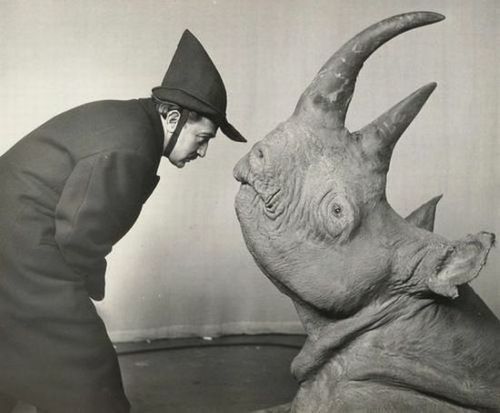 "Vous disiez sur un rhinocerous?" But the rhinoceros itself was of no moment any more! I was very troubled by this disturbing event concerning Jean, so I finished my Alsatian beer, bid him "Adieu" --- I mean "Goodbye!" --- and returned to my apartment. As I departed, I did happen to notice the rhinoceros had formed a conga line with many of the townsfolk in tow. Madame Foucault, my landlady, greeted me as I arrived home. A fine woman with a hint of wistful sadness and a wart the size of the Cathedral at Rheims, she began to beat at me with an enormous loaf of French Bread. You see, I owed her some rent stemming back to 1937, which was a bit odd since neither of us had been born then. "Madame Foucault," I said, "a most curious thing. My friend Jean can only speak French!" "Donc?" she replied. "Nous sommes français, ne sont pas nous?" "Oh crap! You too?!! This is supposed to be an English translation by Professor Herbert Mishkin! He’s an expert on Romance languages! At least that’s what it said on his resume." "But how could that be, the guy’s supposed to be Jewish! He’s up for tenure. There’s going to be hell to pay!" "Quel est le problème avec vous, visage de merde!" "Maintenant venir et écouter mon histoire d'un homme nommé Jed ..."
Every line of dialogue was in French. Even descriptive passages were now in French! I was seized with despair! Had Professor Mishkin deserted us? In a Mishkin-less universe, was life nothing more than a pink rhinoceros leading a conga line? Not that I hadn’t seen worse acts in Toulon! And why did I yet speak English? I longed to be like all the others, speaking in my native tongue, pondering the meaning of existence, and insulting American tourists. “Professor Mishkin!" I cried out. “Professor Mishkin! When are your office hours?" “They would have been in an hour, Berenger," it said, “but I was so wasted last night right now I’m home with the clicker." "Professor, everyone here is still speaking French! WTF???" “Truth is, Berenger, I’ve been so damn drunk this week the only character I’ve been able to translate so far is you." "You’re not that difficult to translate, you’re fairly simple-minded. Now, Madame Foucault --- that’s a character!" "Oh, you're most welcome, Berenger." "Now cut the literary slurs and get back to the job! Thousands of students taking Intro to French Lit won’t have anything to read along with their Cliff’s Notes!" "Yeah, but it’s a Friday and, heh heh, I got me something going this weekend. I’m counting on you, Berenger, to stall Shmendrick Publishing until Sunday. Monday, if I get really lucky." "Just keep speaking English," said Mishkin. "Cut off any of the characters that try to speak in French. Talk over any exposition or descriptive passages that creep back into French as well. Just til I get back." And so, I live in a land of desolation. Of lies and deception. Of creased pages, bookmarks, and chocolate stains. Do I still believe in Mishkin? Yes, I do. That is, provided he knows how to reciprocate. * "No, I think I missed that." ** "I don't know. We are French, aren't we?" *** "Did anyone verify his resume? Maybe he lied." **** "Michelle, the very hot!"